Today, I am finally getting around to a review I have wanted to do for a while now, George Dickel Tennessee Whisky. 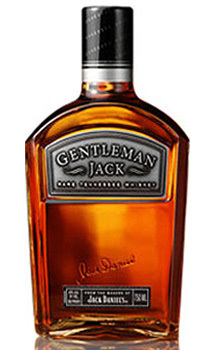 I have reviewed a few Jack Daniels products on the blog, and I had a number of folks ask me about George Dickel. I’ll save my thoughts about Dickel vs. Daniels until the end, but suffice to say I am excited to put my thoughts out on this one. Like Jack Daniels, George Dickel charcoal filters their whisky (Dickel drops the “e”) before putting the spirit in the barrel. Unlike Jack Daniels, George Dickel chills their spirit before letting it drip through the charcoal. There really is no right way to charcoal filter a whisky, so long as a distillery does not try to call their charcoal dripped whisky “bourbon.” That said, charcoal filtration does not necessarily mean the product is better or worse. Purists might not want their product tainted by the process, and many bartenders prefer to make their drinks with the smoother, cleaner whiskies that are produced by charcoal filtration. Like most things in whisky, it is a matter of personal preference. The first whisky to be reviewed from George Dickel is their No. 12, “White Label.” There is no age statement on this whisky, but I have heard it rumored around 6-8 years old, with some older stocks blended in. It is bottled at 90 proof (45% abv), and is often available for under $25 in places where I don’t live (so I am told). The nose on this whisky is unmistakably unique. There are notes of praline, caramel, marzipan, raw oats, some maple syrup, all with a solid backbone of cereal grains and sweet corn. The palate is medium-bodied and continues a lot of the cereal notes from the nose. There are a lot of oats, and a bit of caramel-covered peanuts. The finish is medium-short, with some lingering corn and some honeycomb. Overall, this is a tasty, drinkable whisky that gives great indication of the quality of George Dickel. My Grade: B-/C+. Price: $25-30/750ml. This is a fine whisky, definitely worth keeping around the cabinet if you are like Tennessee Whisky. The second whisky I am reviewing today is George Dickel Barrel Select, George Dickel’s premium whisky. It is bottled at 86 proof (43% abv), and it is aged between 10 and 12 years. 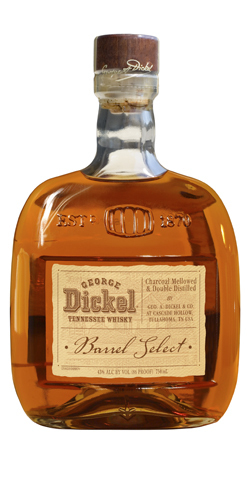 According to George Dickel’s website, each bottle of Barrel Select contains approximately 10 barrels, making it the smallest batched whisky that George Dickel makes. The nose on this whisky is drop dead gorgeous, presenting complexity galore. There are notes of cocoa, bananas, and white chocolate, all wound tightly around spicy oak notes. The palate is especially sweet, but not too much so. Those banana flavors are still there, along with vanilla, dried pineapples, apricots, butterscotch, and almonds. The finish is medium in length, a bit longer than No. 12, with a nice complexity. There is caramel and butterscotch present, but there is also the complexity of oak and spiced almonds. Overall, this is a wonderful whisky. My only complaint is the lack of body. I think at a slightly higher proof, the flavors would hit harder and this whisky would warrant an A- or an A from my taste buds. My grade: B+. Price: $35-40/750ml. For my dollar, this is the finest whisky I’ve had from Tennessee to this point, and it is a great whisky for those sultry summer afternoons. Between these two George Dickel whiskies, I am definitely partial to the Barrel Select. It is the more complex and the more delicious (in my opinion) of the two whiskies. That said, No. 12 is still a great buy. As far as that other Tennessee Distillery that over-advertises and underachieves, George Dickel beats the pants off of similarly priced Jack Daniels products. Although the Barrel Select still does not measure all the way up to my favorite bourbons, it is a top notch whisky that works well for special occasions and weekday evenings alike. So, don’t be afraid of Tennessee and give Dickel its due. There is some fine whisky coming out of Cascade Hollow, Tennessee, and well worth letting it ride.